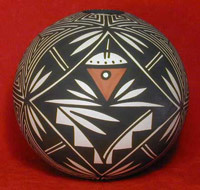 For 1,500 years the Zuni have made pottery with coils of clay creating many designs & shapes to suit different purposes. Our Zuni collection includes artist like Noreen Simplicio, Marcus Homer, Deldrick Cellicion, Tony Lorenzo and Helena Spencer. Here we are proud to display some beautiful pieces by famous Hopi potters Ergil F. Vallo (known as Dalawepi, who is now deceased) and Loretta Silas. 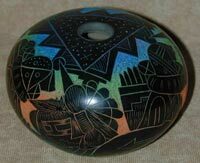 Jemez Pueblo, located northwest of Albuquerque, New Mexico, is the home of several families of fine potters.Jemez potters are known for their variety of styles. Here you will find many different pieces by Priscilla Loretto & daughter Laverne Loretto. This pottery was created to honor a favorite horse or celebrate the birth of one. 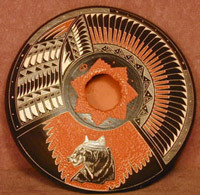 The pottery is fired using the hair from the mane and tail of a horse. A certificate of authenticity guarantees it has been handcrafted by a Native American Indian artist. 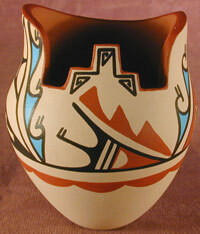 Acoma Tribe pottery is famous for its detailed designs and bold colors and images. The "free hand" line painting symbols usually deplict Nature. Our pottery is individually handmade by various Navajo potters including Westley Begay, Doreen Lansing, Ella Cadman and Rose Pecos Sun Rhodes. 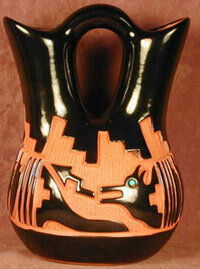 Also featured are some NEW double etched pieces from up-coming Navajo potter Terri Saxon. 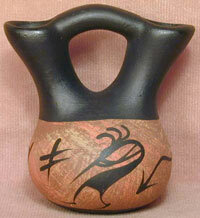 Some of the most beautiful pottery in the world comes from the Santa Clara Pueblos. We have found a line of pottery, by artist Hanna Jay, which is done in the Santa Clara �style� but has a more reasonable price for those wanting this style of pottery. The Ute Tribe enjoy a modern lifestyle but have retained their traditional customs. They are established artists known unique pottery.